Teaching self help skills is so important for any child. But, for kids the autism spectrum this can be difficult. Many children benefit from visual schedules and routines to help. 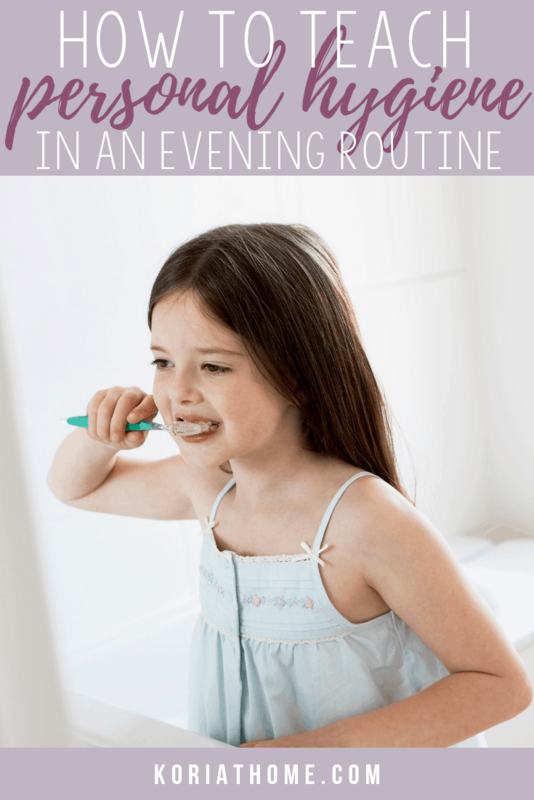 The personal hygiene chart was meant to become an integral part of creating a functional and predictable evening and bedtime routine. Having these routines in place is huge for autistic children because it helps them have more control over their environment. Using visual schedules and supports can also promote Independence in autistic children. Along the same lines as my daily schedule, bathroom chart, and what to wear chart– this printable set was designed with autistic children in mind and can be used in combination with more of my free printables for autistic children. However, you can also use this chart set for pre-readers or any child who may need the visual schedule. 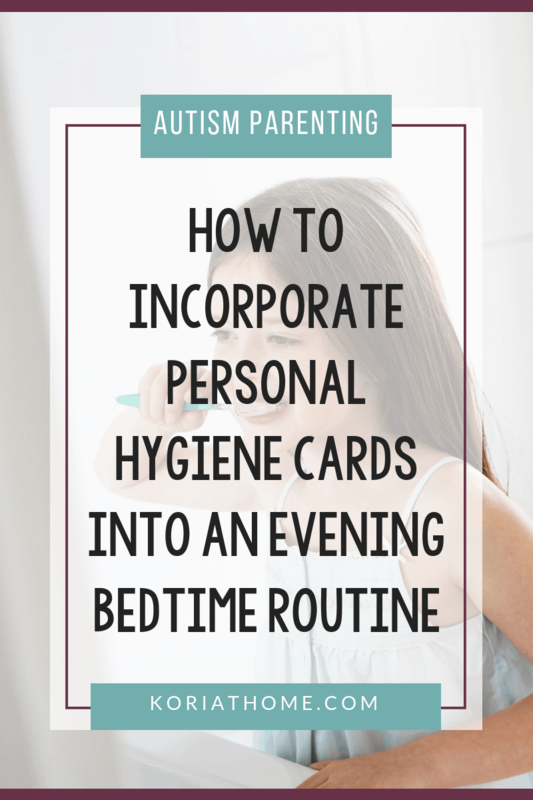 And though it’s called a personal hygiene chart in the file, this is really more of a bedtime routine chart and cards set. I will be happy to make new charts that properly reflect this if you’d like. Just let me know. 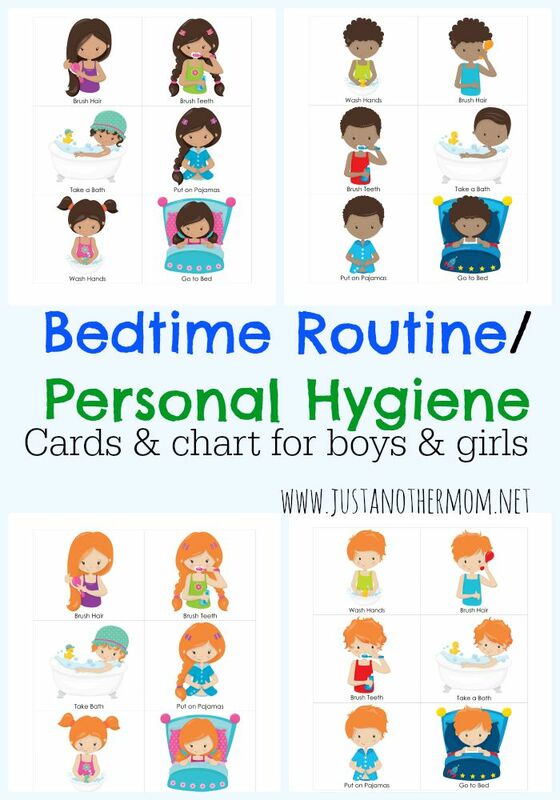 There are cards for the following actions for both boys and girls to create a daily hygiene routine chart in addition to a bedtime routine chart. You can use this for a nightime routine chart in addition to my daily routine chart. You can also use these in addition to My Personal Schedule printable pack which is available for sale in my shop. The chart colors for girls are pink, dark purple, light purple. However, if you would like an additional chart color please let me know! Colors for the boys charts are: red, blue, and green. However, if you are in need of a different color, please let me know and I will be happy to create one for you! If you find that you don’t need a particular skin tone or hair color, when you’re printing, just print out the page number that corresponds with the set that you need. Also included in the pack are three charts. Each chart will hold all six cards so you can use that as a display or use one column for tasks and one column to be completed. You can also use these cards on their own with a clip ring. These are so cute but I was wondering if you have a card for “Say your Prayers” ??? I do not have one in this pack (as the provided clipart didn’t provide an applicable image), but I do have one in my Daily Routine pack. i love how there are little brown children!!! thank you!!! Do you have a potty-related one by any chance? These are fabulous, but only thing missing is a potty time card (we’re potty training…sigh). Thanks! Thank you so much for the feedback 🙂 I do have this set here: http://www.justanothermom.net/printable-bathroom-chart/ but the clipart is different. These are adorable!! I love them! I would love to have a morning one just like this set but with take vitamins, get dressed and eat breakfast added to it. I saw some of your other sets with some of those things added but I love these clip arts. So cute! If you make anymore with these girls I will be the first one to print.? These are great, and amazing that you’re giving them away for free. I’ve seen things like this up for sale on other blogs!